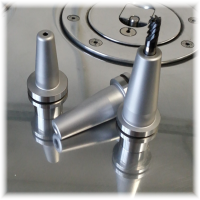 For High-Precision or Ultra-Precision machining not only a suitable machine and spindle solution are required, but also the corresponding tool holding because as an aditional interface between the spindle and the tool it is jointly resonsible for precision and dynamics. Together with a spindle taper run-out of less than 50 nm and best dynamics our spindles are well prepared for Ultra-Precision and High-Speed Machining. However, looking at commercially available HSK tool holders that comply with DIN69893 makes clear that those are not suitable for Ultra-Precision Machining because of two main reasons. With a specified tool run-out of 3 micron this value is about 60 times worse than it is for the spindle taper of our tool spindle ASD-H25. 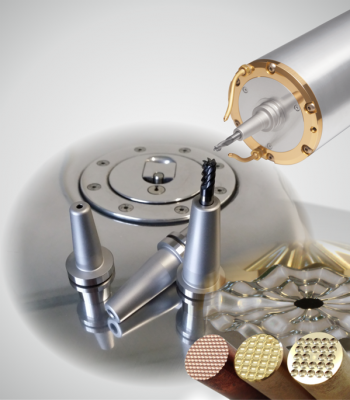 Secondly our spindle shaft assembly is balanced to G0.05 at 60.000 rpm. Using a standard tool holder this would mean a 20 times higher residual by the tool holder as it is for the entire shaft. A third point is repeatability. Although the form error of the taper is not specified we could measure a form error of 0.5-1 micron for standard tool holders. Bottom line, Ultra-Precision must include the tool holding, and by making use of our highly specialized manufacturing technology we were able to develop our HSK tool holder series UTS-x that comply with DIN69893 and give 0.8 micron tool run-out as well as a balancing quality of G0.3 mm/s at 60.000 rpm. Using our spindles for holding and spinning our tool holders during production and balancing is not only useful because of their accuracy and speed, it also perfectly matches with their later use in the spindle. 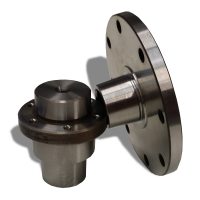 Our Ultra-Precision tool holder series UTS-x is available for the spindle interfaces HSK-E25 and HSK-E40 and allows the shrink fit tool clamp of a large variety of shank sizes. Also available are custom tool holders with HSK-E25 or HSK-E40 spindle interface to carry flycutting discs or grinding wheels. Get in touch with us to find the right custom tool holding solution for your application!